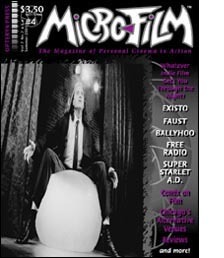 MICRO-FILM is an independently-published magazine that has covered low-budget cinema since 1999. 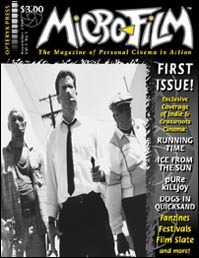 Each issue listed below is linked to a comparable page on the primary MICRO-FILM Web site where you may find ordering instructions. Any questions or errors can be directed to the Editor. 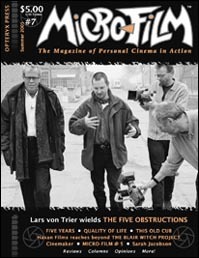 Jorgen Leth on THE FIVE OBSTRUCTIONS; Haxan Films after THE BLAIR WITCH PROJECT; Brett Wagner on FIVE YEARS; QUALITY OF LIFE; Charles Band’s Cinemaker; MICRO-FILM turns 5; THIS OLD CUB; Sarah Jacobson; SCUMROCK; 50-plus reviews; rants; more! 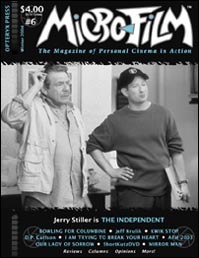 Stephen Kessler and Mike Wilkins give props to THE INDEPENDENT; Michael Gilio on KWIK STOP; Sam Jones on I AM TRYING TO BREAK YOUR HEART; BOWLING FOR COLUMBINE analysis; Jeff Krulik; D.P. Carlson; Christopher Frieri; Parallel View pt.2; 40+ reviews; resources; more! Wm. 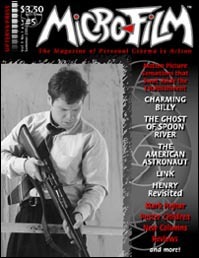 R. Pace on CHARMING BILLY; Scott Meehan on THE GHOST OF SPOON RIVER; Cory McAbee and Bobby Lurie on THE AMERICAN ASTRONAUT; Steven A. Jones and Chuck Parello revisit HENRY; Mark Hejnar; Poster Children; Parallel View pt.1; 40 reviews; rants; more! 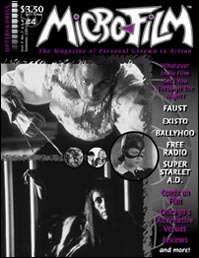 Coke Sams and Bruce Arntson conjure EXISTO; Brian Yuzna and David Quinn on FAUST; Mike Allred and Christopher Coppola on G-MEN FROM HELL; Dan Clowes on GHOST WORLD; FREE RADIO; SUPERSTARLET A.D.; Jim Sikora; Jill Godmilow; 30+ reviews; resources; more! 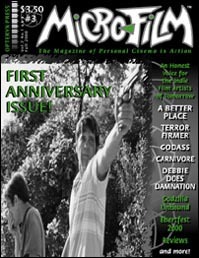 Vincent Pereira on A BETTER PLACE; Eric Brummer on DEBBIE DOES DAMNATION; Lloyd Kaufman on TERROR FIRMER; Ken Mader and Frank Kurtz on CARNIVORE; Digital versus analog filmmaking; GODASS; THREAT; Guy Maddin; Ross Hagen; 20 reviews; rants; more! 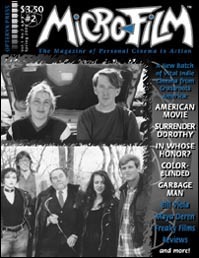 Kevin DiNovis on SURRENDER DOROTHY; Chris Smith on AMERICAN MOVIE; Mark Pirro on COLOR-BLINDED; ICE FROM THE SUN dissected; Hart Fisher on THE GARBAGE MAN; Jay Rosenstein; Maya Deren; Bill Viola; Freaky Films; Forry Ackerman; 10+ reviews; resources; more! Josh Becker on RUNNING TIME; Eric Stanze and crew on ICE FROM THE SUN; Lane Soelberg on pURe kILLjoy; Michael Wiese on COYOTE’S HONOR; Mike Trippiedi on DOGS IN QUICKSAND; Visits to Slamdance, Sundance, and SXSW; Indie film zines; Synapse Films’ Don May, Jr.; more!